There is a real craze at the moment for wild water swimming or swimming in natural water – I think it may have started with the wonderful book Waterlogged by Roger Deakin. In it he journeys from one end of the country to the other via any outdoor swimming places, from rivers to mill ponds and the sea. His own story is fascinating, as he lived in a moated house and swam in the moat every day. He was also responsible for the Common Ground movement which celebrates local diversity and helped to save many of our heritage orchards. Sadly, he is no longer alive, but if you haven’t read it, do get the book – all of his writing is excellent. Anyway, I digress. The passion for swimming in natural water has become so popular, I believe, because it brings us close to and in touch with nature. We are all realising now how toxic chlorine and the other chemicals are in a normal swimming pool – I’ve had a number of people tell me they can only swim in a chlorinated pool once a week because of the effect on their skin. 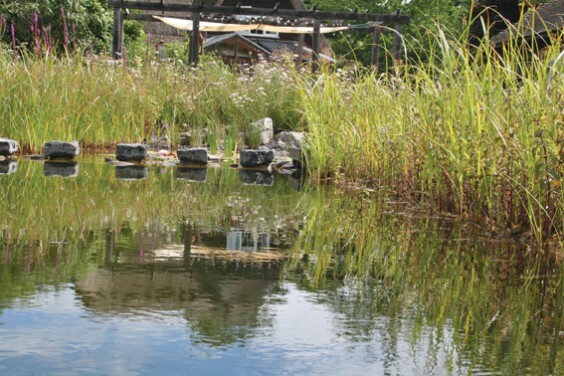 As some of you will know, we have converted a chemical pool into a natural swimming pool – or probably more accurately a swimming pond, as in my situation I am reliant on the plants to do the work of cleaning the water. In its simplest form, the plants grow and take out the nutrients in the water (we know plants do this from the soil). This cleans the water and it is then pumped back into the swimming zone. The plants are kept clear of the swimming zone, so you swim in naturally cleaned water but not in weed or mud like normal outdoor swimming. As with any water feature it is very wildlife-friendly. Ours has newts, both great crested (a protected species) and smooth; dragonflies; a few frogs (but not many); and great diving beetles, to name a few. Once the plants grow up it’s beautiful and flowers throughout the summer. The combination of plants is absolutely key to making this type of pool work and I’ve found it fascinating to learn about a whole new area of horticulture that I didn’t know before. It’s such a massive subject that you can never know it all. The maintenance is quite straightforward. Like any gardening work, the plants need cutting back in spring and autumn and the leaves removed – you are trying to create as clean a system as possible to prevent algae build-up. Most people ask about temperature; you can heat these pools, which most people do with solar power or renewables. Ours regularly gets up to 20 degrees in the summer and as you are continually pumping the swimming water into the shallow warm water where the plants are, it warms up well. Some people cover the swimming area at night as this is the time when most of the heat is lost. I always knew this project would be a learning curve and as with anything you do for the first time, I would do it differently next time – understanding much more the need for the water to stay in the regeneration (planted) zone for as long as possible. As part of the ongoing adventure I have also met and am working with a company called Poolscape, who are based in Hereford and have been building these pools for more than 30 years. The technology has come over from Austria and Germany where it has been developed and used in thousands of pools, and these systems are now available here. If you want a very clean, contemporary look, it is possible to have a natural swimming pool without the planted area – this is called a Living Pool and it means you are still swimming in chemical-free water. The technology operates on two systems: a skimmer that continually filters the water and a second system that runs a biological filter and takes the phosphates out. My preference is for some planting, as the wildlife element for me is so much part of the experience and the planting edges look stunning. As a gardener I also find the planting combinations used fascinating; there are some fast-growing reeds that do the bulk of the nutrient uptake, grown in a clean gravel bed without soil so no nutrient is added. The water is then “polished” by other plants, particularly a water lily bed with oxygenators growing in the shade underneath. The added benefit is that this water lily area is perfect for newts. In my pool they live in this bit most of the time when they are in the water, and I have added an oxygenator called Water Milfoil (Myrophyllum spicatum) which has a fern-like leaf – the newts lay and wrap their eggs in the leaves. It is important not to swim in these pools with anything on your skin, such as suntan lotion, as it unbalances the water, so a shower before can be necessary. But the feeling on your skin afterwards is soft and invigorating. I’m sure you can tell that I am a fan, particularly where people have converted an ugly, run-down swimming pool into a natural pool with all the wildlife benefits it brings, plus they are beautiful to look at. Most of these projects are still in private homes, but there are more now in public spaces and that is a great development. The experience of swimming in one of these natural pools is so different to swimming in a normal chemical pool. If you are interested in your own natural swimming pool project, do give me a ring sometime.